I've been wanting to get another tattoo for some time now, but waited until I was completely and entirely without-a-doubt sure of what I was going to get (and where I was going to get it). Which is a good thing, I'm sure, when it comes to something that is going to be with me until I'm old and gray. My first tattoo was something I did somewhat impulsively—with a friend, of an image I'd printed off a website, when I was twenty and eager for a bit of adventure. It rests on my lower back (an often-mocked location, but I'm glad I chose to place it there) and is of the Chinese symbol for "blessed". To this day, I don't regret it. Mostly because whenever I see it I'm brought back to that time in my life, and I love what it symbolizes. My only fear is of a Chinese person coming up to me on the beach with a quizzical expression, asking me, "Is there a specific reason you have the words baked potato tattooed on your body?" And then I will cry. But it hasn't happened yet, so I suppose I'm okay. 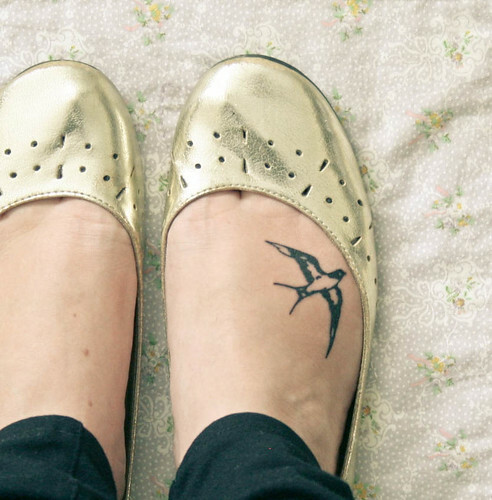 As for my newest tattoo, it's of a sparrow illustration I've carried around with me for nearly two years. (I've decided that's the best way to make a decision like this—to keep the image in a place you will see it almost daily, to be sure it's something you truly love.) I saw this bird on a postcard and loved it immediately. I don't think that a tattoo has to have a grand story behind it in order for it to be special. Mostly, it should mean something to you. It should be something that makes you smile when you see it, that you're sure will make you smile fifty years from now. For me, it was this bird. My dad came for a quick visit this past weekend, and when he said he wanted to get a tattoo I knew it would be the perfect time for me to finally get my sparrow, too. My dad has been in the Navy for most of his adult life, so tattoos haven't been something he's shied away from. He has several, and was going to get my and my sisters' names around a tattoo he already has of my mom's name on his chest. The tattoo artist did a fantastic job designing his, and it turned out perfectly! My dad had his done first, so I had to stand around feeling awkward and slightly nervous while listening to the hum of the tattoo needles. It had been so long since I got my first one, I was wondering if my memory of it not being all that painful was horribly inaccurate. Of course, when it was finally my turn, the artist made an offhand remark about how the foot is an incredibly sensitive place to get a tattoo. I gave him a look like, "Way to give me hives, man." And he sort of shrugged like, "Well, it's only fair to warn you, lady." As it turns out, I think my pain tolerance is officially much, much higher than I thought it was. (I should've known, after doing so well with contractions when I had Eisley—if I may sing my own praises for just a moment.) The tattoo felt like it went very quickly (I think it took around 30 minutes, but I'm not completely sure) and there were only a couple moments where it really made me flinch. I was rather proud when a couple of the tattoo artists mentioned how well I was doing. Gold star for me! The girl who is afraid of everything! Hurrah! I'm so glad I got the tattoo, and it made it even more special to share that memory with my dad. On the drive home, we laughed about how someday we'll talk about that one time we went to that random tattoo shop down by the docks and got inked. Which makes me smile. I LOVE this! As soon as I saw it Lauren Hill singing "his eye is on the sparrow" played in my head :) Your artist did such a great job too, it looks perfect! 1)I don't regret mine either, 2) the foot IS painful, but also very bearable, 3) so is the back of the neck, and 4) I had someone approach me in Santorini, Greece, after seeing my Chinese tattoo, and tell me what it meant. So I think we're good. Getting a tattoo with you is seriously one of my favorite memories. :) I know I have video of it somewhere, but who knows where it ended up...I totally want to watch it now. I love it and it is so sweet that you got to share it with your dad! The sparrow is adorable! And its great that you got to share that with your dad! I agree that a tattoo needs to be special. Both of mine have stories that make them special to me. And while I have "the itch" to get another, I'm taking my time to make sure I get something that I'll love for the rest of my life. I love that you got it with your dad. As for me and my plentiful tattoos, I don't regret any of them, even the horrible tribal sun on my back. As unfortunate-looking as it is, it's symbolic of who I was at 18. And I'm so proud of you for getting it on your foot! It IS a painful spot. i love this! your tattoo looks great! i've always wanted a tatto of a bird as well, but i'm worried bc i'm semi-allergic to hair dye (face blew up/ER trip) so i wonder if it would be dangerous to have dark dye go that far into my skin...prob a bit risky. I love your new ink! I've been wanting to get my humming bird in memory of my dad for quite some time now and you may have just inspired me to just DO IT already! That would be so sweet. :) I saw a bunch of hummingbird illustrations at the tattoo parlor and thought they were just gorgeous. I say go for it! Oh I love this, it is so very you, so simple and elegant. I love your tattoo!! I really love birds, and I love the bird design you chose. And the location is cool too. I've always thought the foot is a cool place for a tattoo. That's a good idea about keeping an image, or words, around you every day to see how it makes you feel, before you get a tatoo. That is one of the reason why I haven't gotten a tattoo yet, because I wouldn't be able to chose what I'd want! But someday I hope I'm brave enough to do it! And that's pretty awesome that both you and your Dad had it done together. Very cool. I love your tattoo! I think the way that you went about it too was really smart to make sure it was something you were going to want long term. There are several tattoos that I have wanted for a long time, but I'm too chicken to go and have it done. Hi there! New reader that followed a link from a link to land in your lovely little space. Have been hopping around your archives and am totally internet-smitten with you! Love your writing (and feel more than a little of the kindred spirit with you given our shared Monica-like tendencies ;) ). Just wanted to say hello! PS. I'm not a tattoo person (meaning, I never thought about getting a tattoo on myself, not that I don't like them on others), but I have to say, I love the delicacy of your new one! LOVELY!!! I didn't even know you had a tat, and now you have two. So jealous! It's perfect! And I love that you shared the experience with your dad. I completely agree that tattoos should come after months (or years!) of thought and consideration. They're so much more special that way! My husband has yet to get a tattoo, as well! He isn't technically against them, but he's just kind of apathetic about it. I keep trying to come up with cool ideas for him, but he's just kind of "meh" about it. Darn it all, because I think tattoos are quite attractive when they are well placed and a good design.